Learn about photographing Lupins in New Zealand ! Who doesn't love all those colourful Lupins flowers photos we've been seeing from New Zealand ? Would you like to find out more about seeing & shooting them for yourself ? Well , keep reading & I'll help you out ! Hi everyone, well social media accounts have sure been showcasing lots of beautiful photos from the Lupins Flowers season in New Zealand. This really has become a very popular spectacle for Landscape Photographers. And why wouldn't it, it is a really visually stunning spectacle to see & photograph. I recently took a group of clients on a Lupins Tour in New Zealand's South Island & thought I'd share some valuable information & tips with you so you can go and shoot the Lupins yourself. Being a regular visitor to New Zealand I find the seasons really change from year to year, this is based on weather conditions & contributing factors such as rainfall & soil temperature. The Lupins bloom generally lasts approximately 6 weeks & is usually November - December, I would suggest "prime time" to be somewhere between middle November & early December. We were there in early December & the bloom was a tremendous spectacle with large numbers of Lupins & a vibrant range of colours. You will find the Lupins flowers spread out in most areas throughout the South Island especially areas around water such as rivers, streams & lakes. I would, however, say that there is one area in particular that is a clear standout & regularly has large numbers of dense lupins & vibrant colour ranges of flowers. The region is known as McKenzie District and the main towns are Twizel, Tekapo & Omarama. To the south-west of Omarama on highway 8 you also have the famous Lindis region (well known for the Lindis Pass) & this area too holds thick fields of lupins. Either Twizel or Tekapo townships are great towns to base yourself & have quality accommodation & dining options available. As a self-confessed coffee snob & food enthusiast, I have a couple of favourite local haunts I always visit in this region, Poppies Cafe in Twizel is great coffee & all the food here is outstanding, Kohan Japanese Restaurant in Tekapo is also a great option for dinner. When it comes to photographing the Lupins there are definitely a few shooting tips that will help your images stand out. 1./ Think about your compositions, you want to keep it simple, a lot of lupins in your foreground and quite close to the camera, a good rule is 2/3 lupins 1/3 background or sky. Always consider & look at both shooting formats landscape & portrait (I call portrait "vertical"). 2./ Use manual focus & focus sharply on some lupins quite close to the camera in your foreground you want the lupins nice & sharp. 3./ There is 2 lens types I use, a wide angle like 16-35mm for the whole landscape style image, & a 70-200mm zoom for more of a compressed "arty" look where you may shoot at f2.8 aperture and look to sharply focus one flower & give a deliberately blurred look to the rest of the image. 4./ Use an aperture somewhere between f8 & f18 depending on the depth of field you are trying to achieve, the higher the f-stop number the more depth of field or area in focus you will have. 5./ Use a fast shutter speed ! This is really important as its rare that there won't be some wind moving the lupins in your foreground and you really want to try & "freeze" the shot sharply so you don't get any blurred flowers from swaying in the breeze. Once you've set your aperture & shutter speed you can adjust the cameras ISO setting to auto to allow you to achieve a faster shutter speed. (An example of good settings would be f8 aperture, 1/250th of a second shutter speed & Auto ISO). The Kiwi locals really are great people and I'm sure you'll find them very friendly & hospitable if you're planning on jumping a fence to shoot its good manners to take a drive up to the farmhouse & ask the owner for permission. I do ask though when you're in New Zealand please be aware of the pristine environment around you & look after the place for future generations, do the right thing by mother nature. 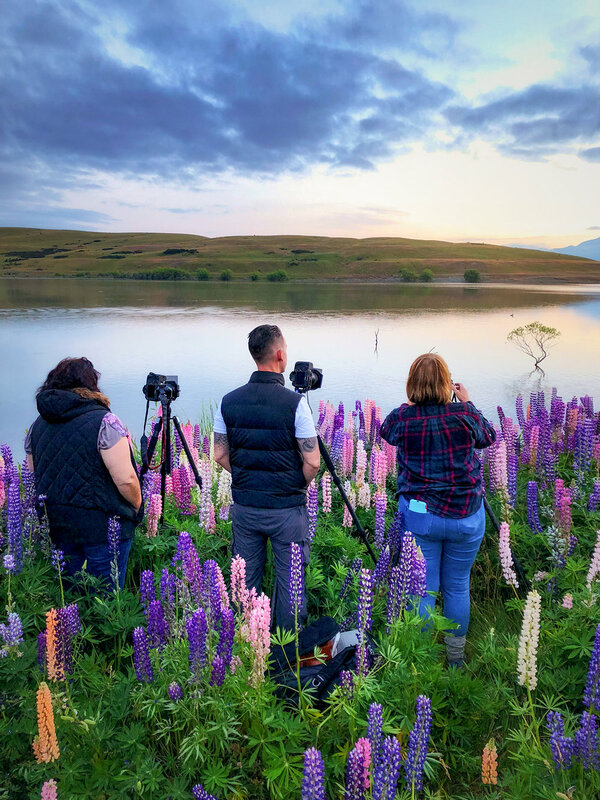 Well, that's about it, I hope the above info helps you out with your Lupins Photography adventure & I'm sure you won't be disappointed with a trip to New Zealand, it's an incredible part of the world with SO MANY Landscape Photography opportunities. All the best & happy shooting Brett. blog posts from photographic adventures.